A public celebration will be held on Friday, March 24, 2017 to mark this significant milestone in extending BART service to the South Bay. The event will include speeches by dignitaries, a ribbon cutting, entertainment, and light refreshments. BART will also have a new train on hand for public viewing. Regular train service into the new station will NOT be running on March 24. 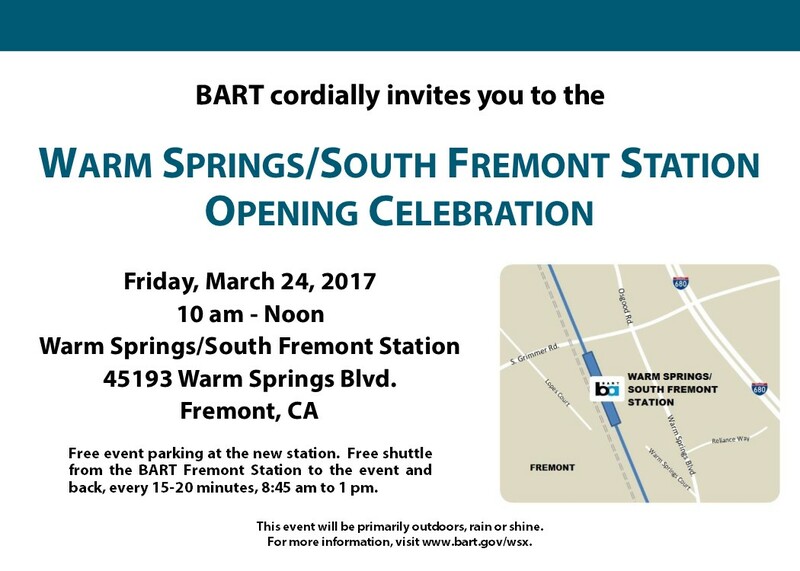 Members of the public wishing to attend the Opening Celebration can drive to the new Warm Springs / South Fremont Station and park for free. A free shuttle from the west side (near the clock tower) of the Fremont BART Station to the event will run from 8:45 a.m. to 1 p.m., every 15 - 20 minutes. Regular BART service begins at the Warm Springs / South Fremont Station Saturday, March 25, 2017. This event will be primarily outdoors, rain or shine. For questions, contact: bartwarmspringsextension@bart.gov or (510) 476-3900. The BART Warm Springs Extension is clearing final hurdles of the project. Since the beginning of the project, BART’s project team has endeavored to balance the need to complete the work on time, on budget and to meet design specifications, function and quality, while maintaining project safety standards and minimizing construction impacts to the community. Passenger safety, system reliability and full operational readiness are the top priorities as BART prepares the new line for service. Phase 1 of the Project – the one-mile subway built beneath Fremont Central Park and the eastern lobe of Lake Elizabeth, began in 2009 and was completed on schedule and under budget, early in 2013. Phase 2 of the Project – the final design and construction of the remaining line, track, station and systems, was originally scheduled to begin in 2010 and to be completed in 2014. However, due to funding delays, the start of Phase 2 was postponed to 2011 and its scheduled completion was pushed back to late 2015. The Systems Work – this work is included in the Phase 2 “Design-Build” contract, and is a mix of specialized technical work ranging from: automatic train control, traction power, communications, automatic fare collection and other technical elements. This component, which represents BART’s first fully digitized system to be fully integrated into BART’s 40-plus year old system, adds an extra dimension of complexity to this extension project. Unique Factors Create Challenges to the Timeline – Earlier this year, project testing was repeatedly interrupted by unanticipated faulting within the aging high voltage, 34.5kv power supply cables, needed for providing a reliable power source for the extension. The 45-year-old cables were successfully decommissioned and replaced this summer by BART Maintenance and Engineering personnel – clearing the way for the project to continue with its rigorous testing program. Where Are We Now? BART has recently completed its supplemental verification testing program of the WSX automatic train control system. Following a brief period of "Pre-Revenue Operations" the extension should be ready to begin revenue service operations to the Warm Springs / South Fremont Station. Please stand by for more information. We sincerely apologize for the delay and thank our customers for their continued patience. Pictured (left to right): BART Mobile, City of Fremont Mayor Bill Harrison, City of Fremont City Manager Fred Diaz, and BART Board Director & President Tom Blalock at the Fremont Festival of the Arts. On Saturday, August 1 and Sunday, August 2, 2015, BART representatives partnered with the City of Fremont in a joint booth celebrating the annual Fremont Festival of the Arts event. Director Blalock was on hand both days to greet the community and help answer questions regarding BART and the Warm Springs Extension (WSX) Project. The Director was joined by WSX Project Manager Paul Medved and his project management team along with representatives from BART Police. BART was able to directly engage with more than 1,500 people over the 2-days, ranging from deep conversations about the WSX project to “selfies” taken with the BART mobile. Visitors were pleasantly surprised by the progress to date. The BART Mobile was a “big hit” and a significant draw to our joint booth along with large size visuals, and informative and fun marketing materials. Thanks to the City of Fremont, students from Irvington High School dedicated their community service hours to support the joint booth. On Wednesday, July 23, 2014, the BART Warm Springs Extension Project held a dedication event for the Fremont Station Tile Bench Art . Two bench arrays on the west side of the Fremont Station underwent decorative treatment as part of the Warm Springs Extension Art Program. The artwork consists of glass tile mosaics on the walls, columns and roof undersides of the seating areas. The bench tiles were designed and installed by artist Joe Kievitt. Learn more about the WSX Art Program. On Wednesday, September 30, 2009, over 200 people gathered in Fremont Central Park to celebrate the formal ground breaking for the BART Warm Springs Extension Fremont Central Park Subway Construction. “We have found the way to San Jose,” remarked Scott Haggerty, Chair, Metropolitan Transportation Commission and Supervisor District One, Alameda County Board of Supervisors. The ground breaking ceremony, complete with music provided by the California School for the Blind Jazz Ensemble, included remarks from representatives of organizations from both Alameda and Santa Clara Counties. “This is not just a Fremont project, but a project for the entire region,” commented BART Board of Directors President Thomas Blalock. Other agencies represented included the City of Fremont, the California Senate, the California Transportation Commission, the Silicon Valley Leadership Group, the Alameda County Congestion Management Agency, the Alameda County Transportation Improvement Authority, the City of Union City, Caltrans, Santa Clara Valley Transportation Authority, and the Metropolitan Transportation Commission. Lauded as the gateway to Santa Clara County, the $140 million Subway Contract will construct a mile-long subway for BART tracks from just north of Stevenson Boulevard, under Fremont Central Park, Lake Elizabeth and the Union Pacific rail road tracks to just south east of the park. The contract will also build a new dog park, basketball complex, and parking lot to replace facilities that will been removed next year to make way for construction of the subway. The project will also construct embankment between Walnut Avenue and Stevenson Boulevard for future trackway that will connect the Warm Springs Extension to the Fremont Station. The subway construction is expected to conclude in 2013. Work on the Design-Build Line, Track, Station and Systems (LTSS) contract is targeted to begin in the fall of 2011, with revenue service to Warm Springs anticipated late 2015.
the WSX ground breaking ceremony.